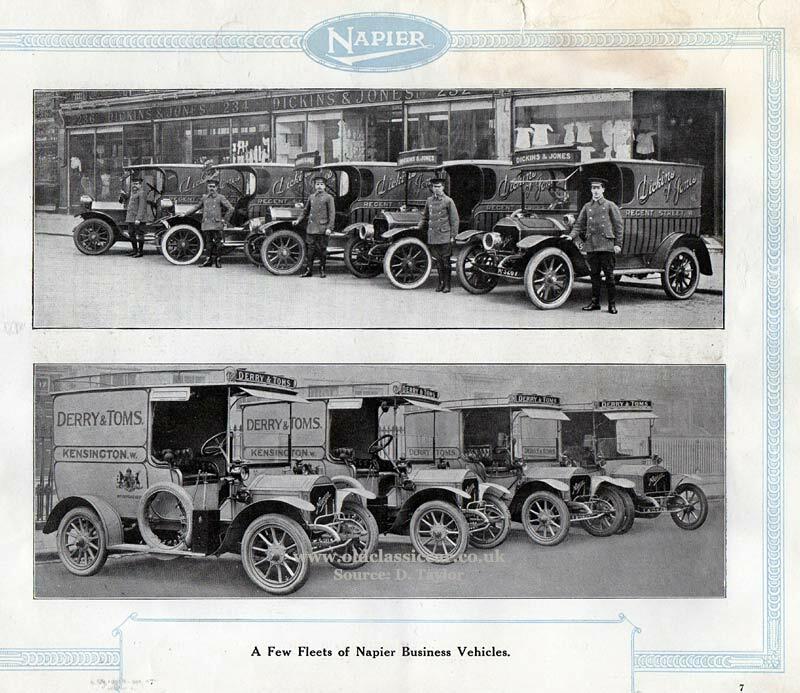 Napier vans, lorries and other delivery vehicles. Homepage. 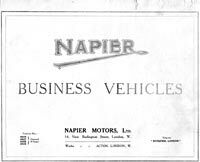 This page: Factory-supplied Napier vans, and one-off coachbuilt advertising vehicles. Return to the Classic van & pickup section. 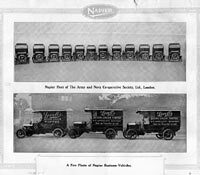 "I have attached a copy of the drawing done by Napier for one of their clients, Harston Pianos, who had shops in Newark-on-Trent and Lincoln. Harston sold pianos with their own name on them, but I understand these instruments were manufactured by Cramer." "I got the brochure from Harston's shop when it was being cleared out before closure. It had been long established at the Newark address, and they were getting rid of a lot of 'rubbish'. 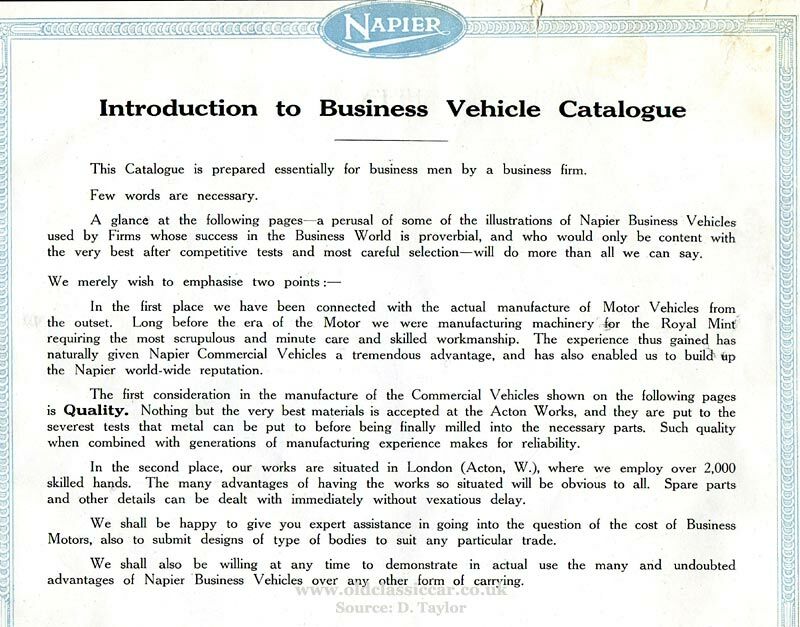 There was a drawing with the brochure, as attached, which was presumably a vehicle they had ordered. There is a date on that drawing. Unfortunately the original paper drawing no longer exists." What a superb find. 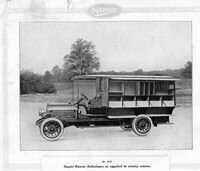 The illustration, by D. Napier & Sons Ltd (Engineers), of Acton Vale, London, is dated May 18th 1912. 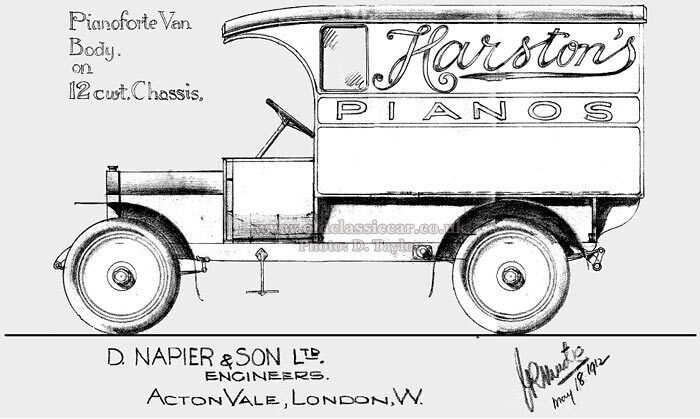 Designed specifically for Harston's, the van is described as a Pianoforte van body, on a 12cwt chassis. Did it ever get built I wonder? Included with the above drawing, and just as rare, was an original sales catalogue that, presumably, also dates from a similar time. David kindly scanned all the pages and sent them over. Click on any of the images to view a larger version. 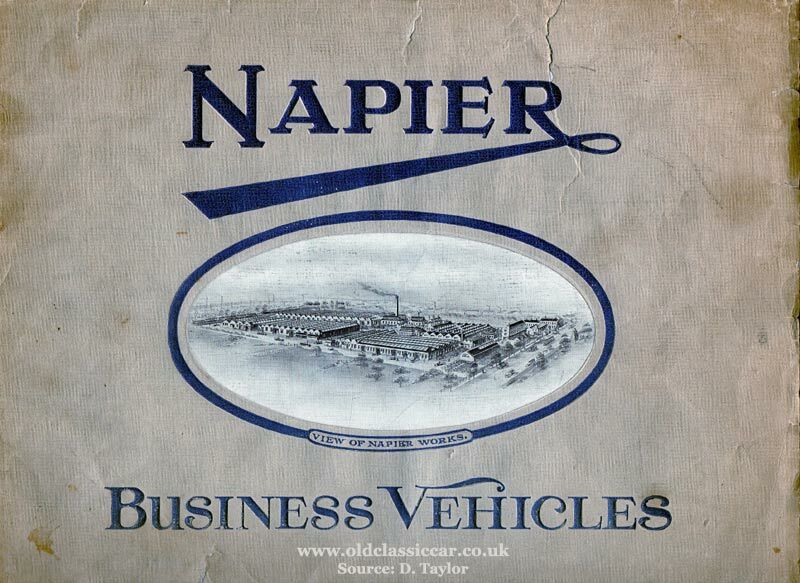 Firstly, the cover of the brochure, titled Napier Business Vehicles. 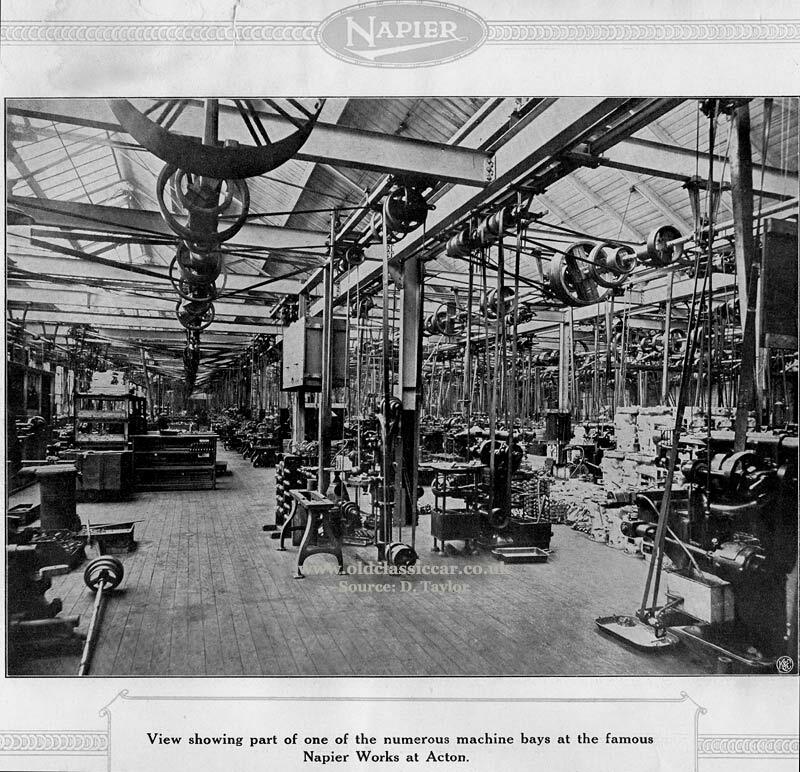 Shown is an artist's impression of the sprawling Napier Works, home to their vehicle design offices and production facilities. 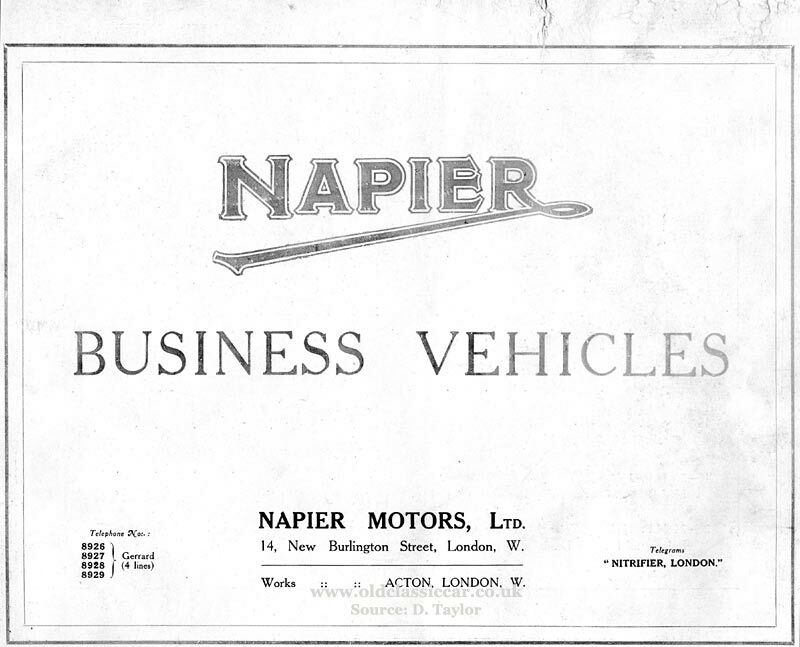 Page one introduces the company, and confirms the location of both the factory (Acton, London) and also their head office, at 14 New Burlington Street, London. 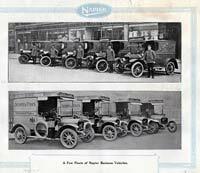 Four telephone lines were available, as was a telegram address: "Nitrifier, London". 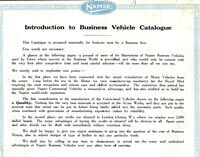 The Index follows, listing the various vans and other commercial vehicles they could supply. These range from a 15cwt delivery van, through larger 1- and 2-ton vehicles, to specialist offerings such as ambulances. 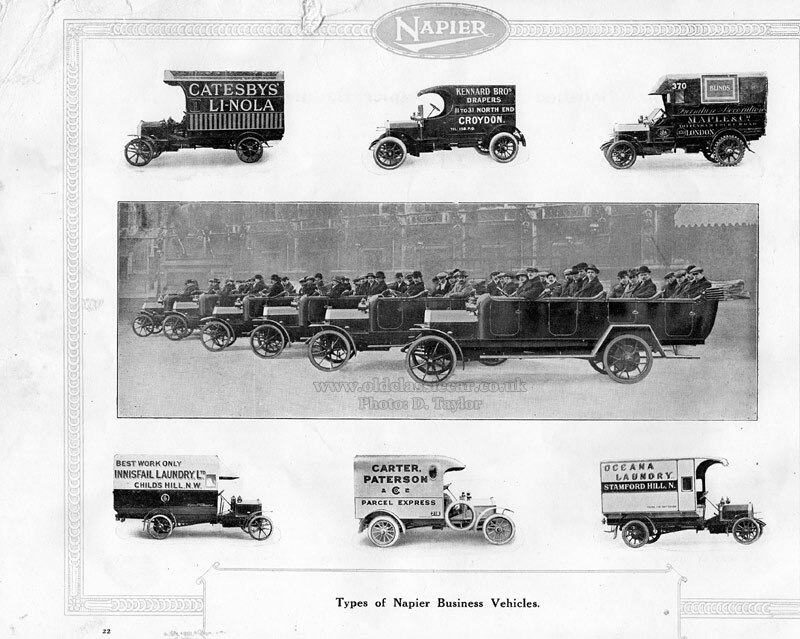 Napier were keen to emphasise the quality that was built into their vehicles, a legacy of their long-standing involvement in the manufacture of top-drawer products, in this case for the Royal Mint. This, in the days before the advent of motor vehicles. 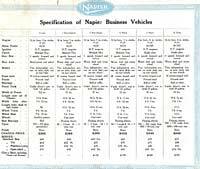 Here, the technical specifications for different Napiers, from the 15cwt upto the 3.5 ton version. Prices are also included. Basic details regarding the different bodies that may be fitted to each chassis are also given. All types had braking to the rear axle only, in addition to a secondary system operating off the main propshaft (ie a transmission brake). 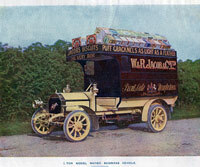 A stunning colour image now of a 1-ton biscuit delivery van, in the livery of W.R. Jacob & Co. Ltd., Biscuit & Cake Manufacturers. 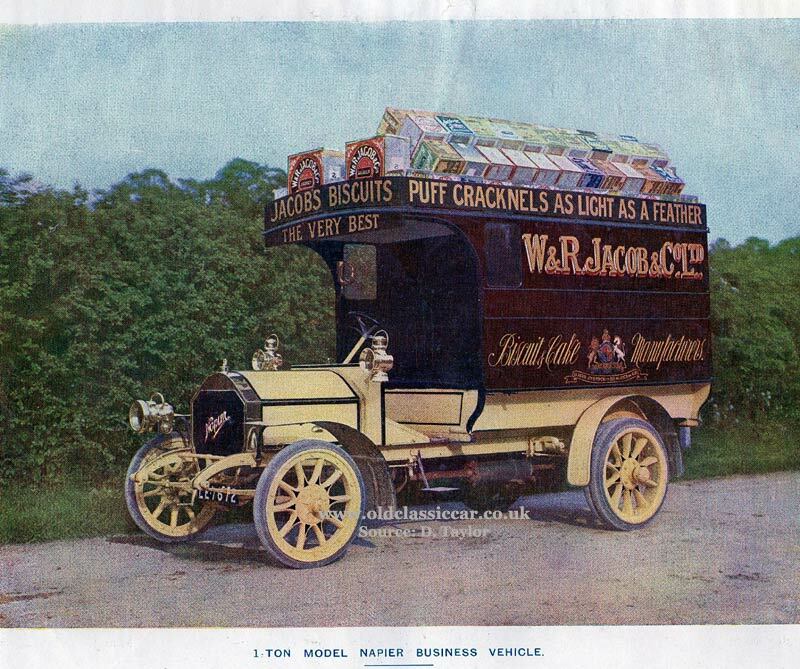 Unlike most companies that feature on vans in this publication, Jacob's is still very much in business, although I believe they no longer manufacture Puff Cracknels (which were "As Light As A Feather" we're told). 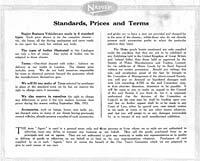 There then follows a list of standard terms and condition with regard to the supply of their motors. Accessories, such as lamps, horns, and tyre tools were available at extra cost. 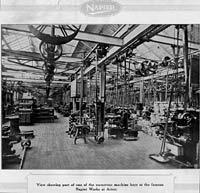 A view inside the well-equipped Acton Works, packed with equipment if not workers, at the time of the photograph. An impressive sight, and a reminder of how so many great engineering works used to look, across the country as a whole. Now, to the vehicles themselves, beginning with two different fleets of vans. Uppermost is the five-strong fleet of Dickins & Jones, Regent Street, accompanied by their proud, uniform-wearing, drivers. Below, and just as neatly signwritten, are four vans belonging to Derry & Toms. Both businesses were department stores in London, the latter in Kensington. 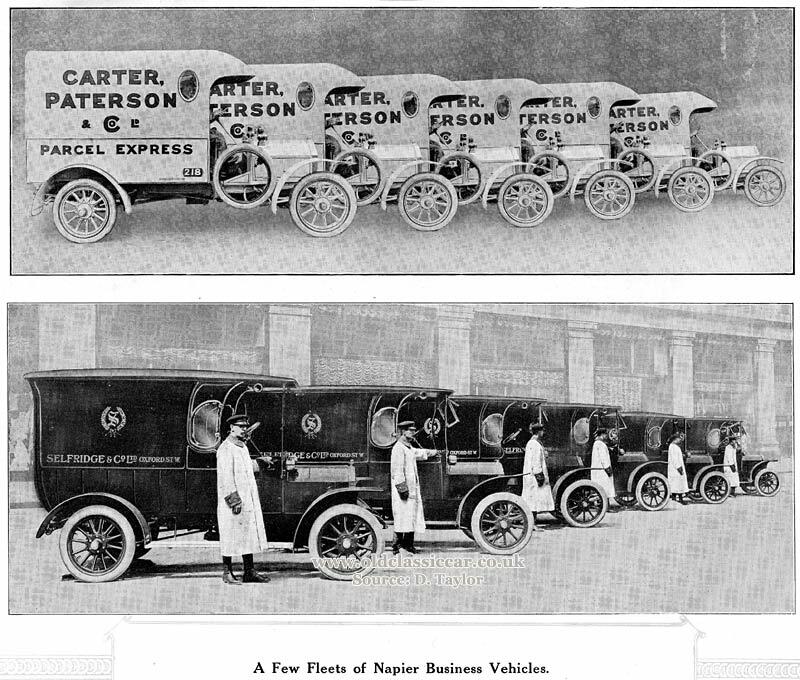 Two more fleets now, those of Carter, Paterson & Co. Ltd. (a parcel delivery firm), and also Selfridge & Co. Ltd of Oxford Street. 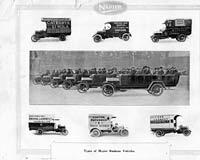 Note the full-length motoring coats afforded to Selfridge's drivers, a nod to the fact that driving these open-cabbed vans was anything but a comfortable job for much of the year. The impressive line-up at the top of this page was that of The Army & Navy Co-Operative Society Ltd, of London. 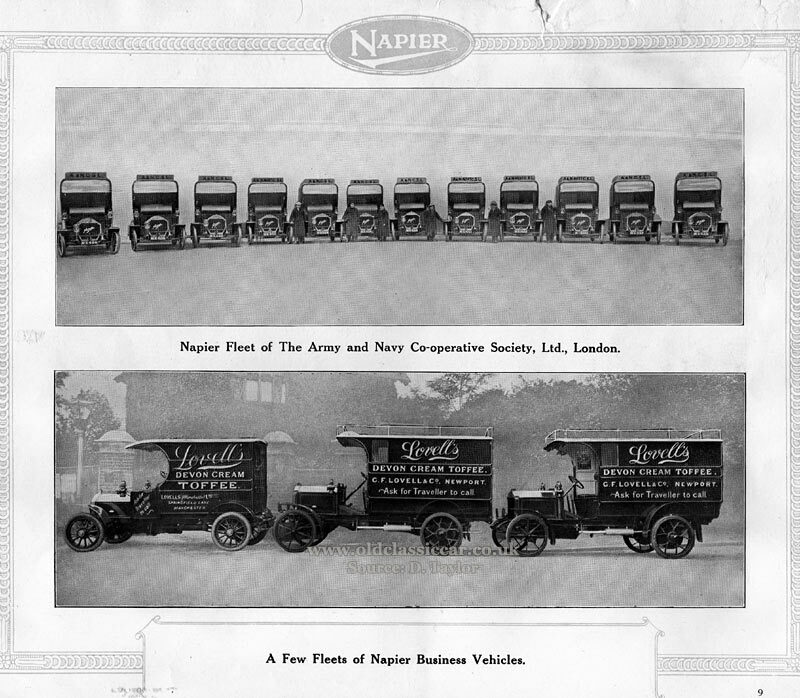 Underneath, a side-on view of three Napiers - all it would seem different models - in the service of Lovell's, or G.F. Lovell & Co. Ltd., a devon cream toffee manufacturer. 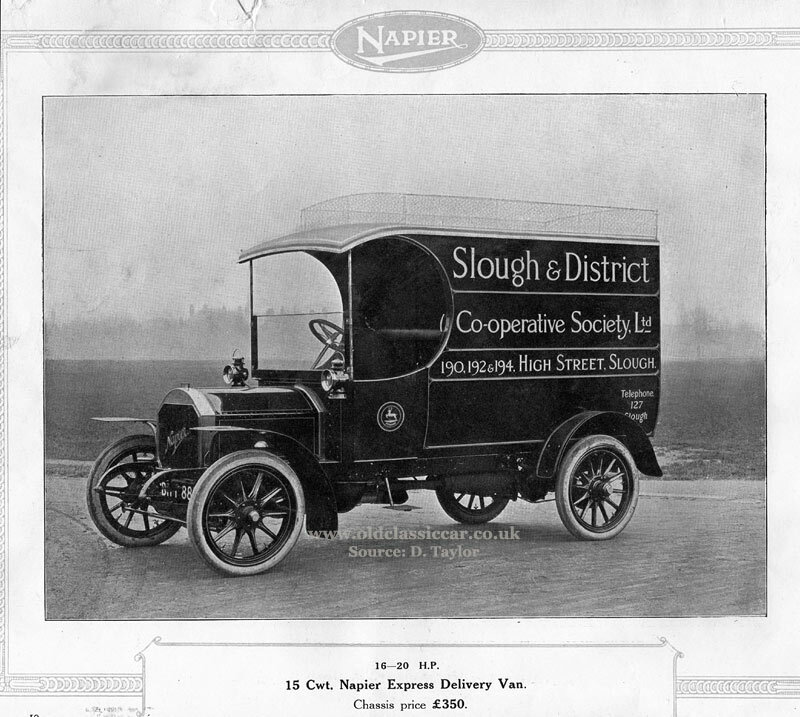 A cracking close-up photo now of a 15cwt Express Delivery Van, belonging to the Slough & District Co-Operative Society. 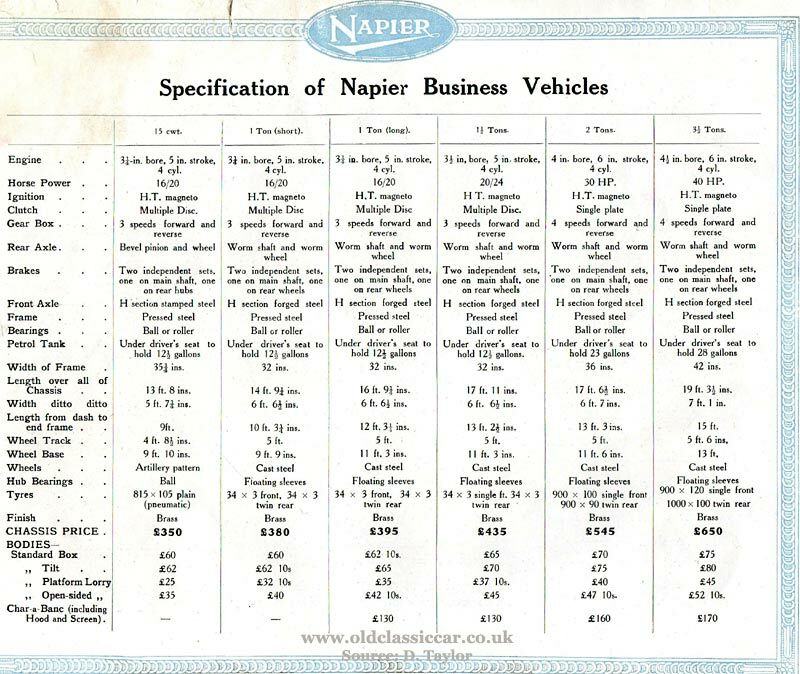 Price for this chassis (excluding C-cab body) was 350 GBP. 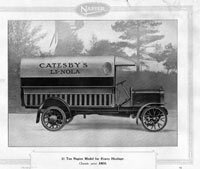 Now a higher-rated van, in the shape of a vintage 1-ton Goods Delivery Van (short wheelbase model). 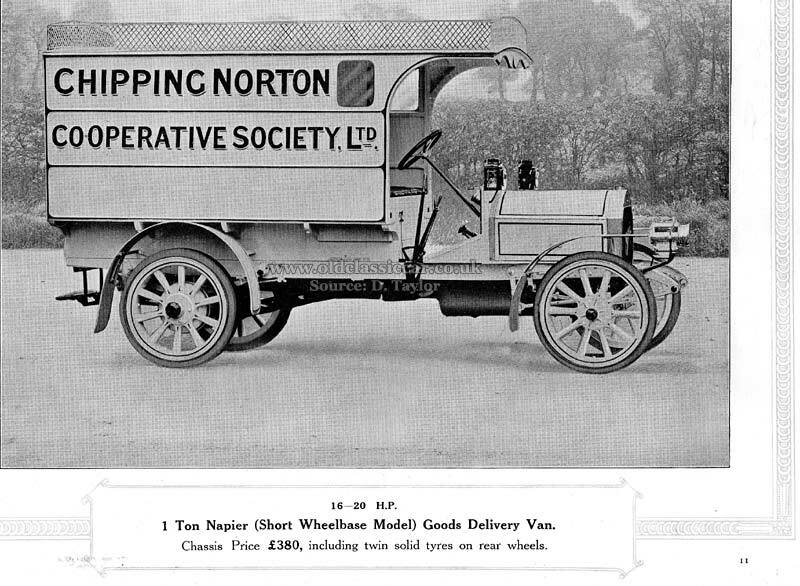 This example, running solid tyres as was usual for the era, belonged to the Chipping Norton Co-Operative Society Ltd. This side-on view clearly shows how exposed the driver would be to the elements. At least this van has a decent assortment of lighting bolted to it. 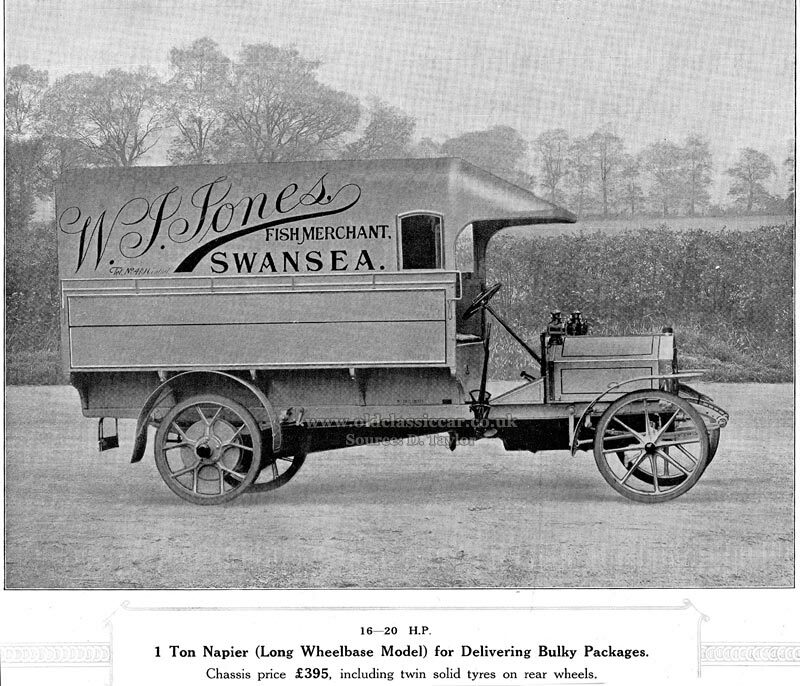 And for comparison, the long wheelbase version of the 1-tonner - "for delivering bulky packages". Different wheels were fitted to this variant. The example shown was built for W.J. 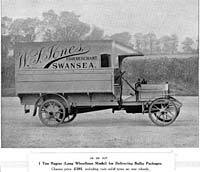 Jones, a fish merchant based in Swansea, South Wales. The lighting set is a little more meagre on Mr Jones' van, when compared to that of the Chipping Norton Co-Op. Moving up the pecking order a little now, with the 1.5 ton 20/24HP version. 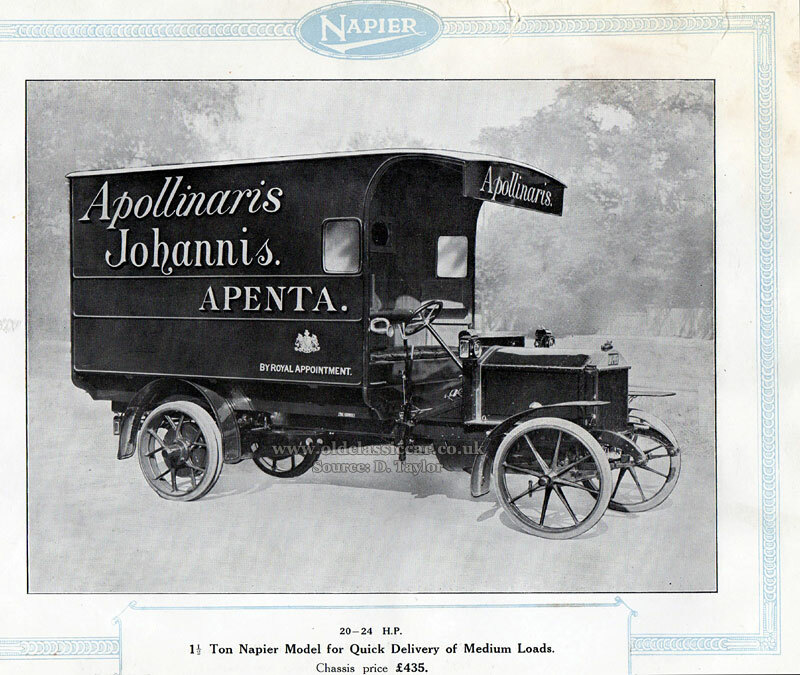 The signwriting on this delivery van reads "Apollinaris Johannis Apenta", due to its regular cargo of bottled mineral waters. Lighting is limited to a pair of scuttle lamps, although the Napier does feature an optional brass horn, fitted just to the right of the driver's seat. 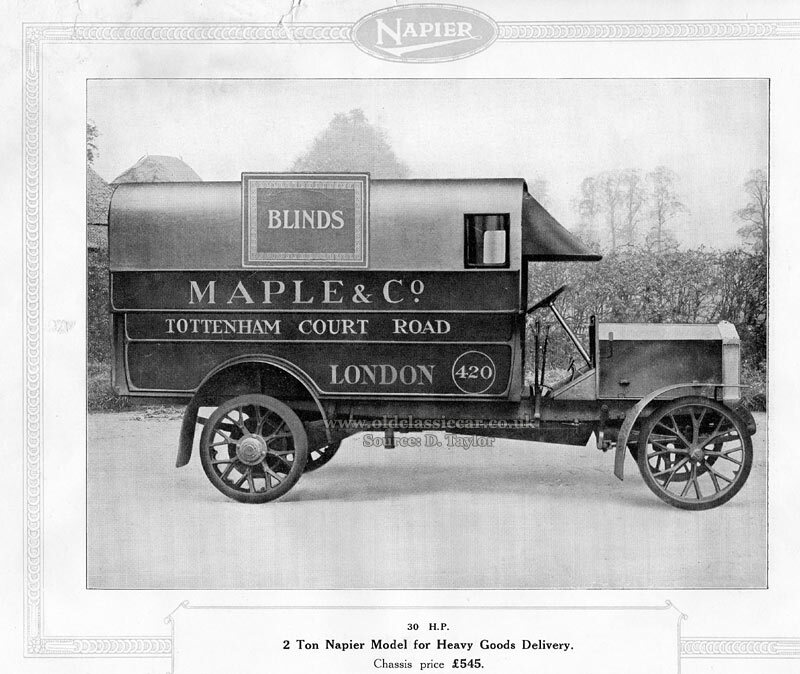 A two-ton load capability is offered with this re-touched photograph of Maple & Co.'s blinds delivery van. No lights at all are installed on this one, perhaps they were removed during the day for safe storage, only coming out again as the daylight began to fade. 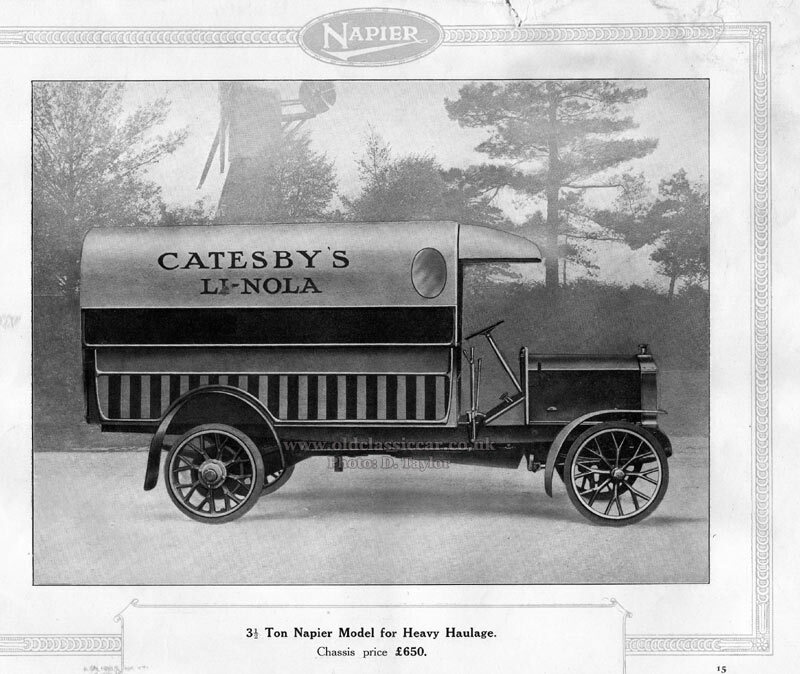 A proper vintage heavy goods' vehicle now, in this artist's impression of a 3.5 ton Napier. The livery is that of Catesby's Li-Nola, a floor-covering more often referred to today simply as "Lino". This is by far and away my favourite image of the lot. At one time, many coachbuilders were approached to build delivery or promotional vehicles in a style that reflected their owners' businesses. I've never seen this creation before, the picture titled as "showing the Napier way of Characteristic Advertising". 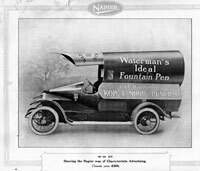 Created for Waterman's, the upper body has been built to represent the look and form of a fountain pen and nib - Waterman's Ideal Fountain Pen to be exact. Below, L. & C. Hardtmuth's "Koh-I-Noor" pencils are featured, with the lower body - from the top of the radiator back to the rear doors - designed to look like the top half of a freshly-sharpened pencil. How neat is that!? Perfect for a jolly ride out to the country perhaps? 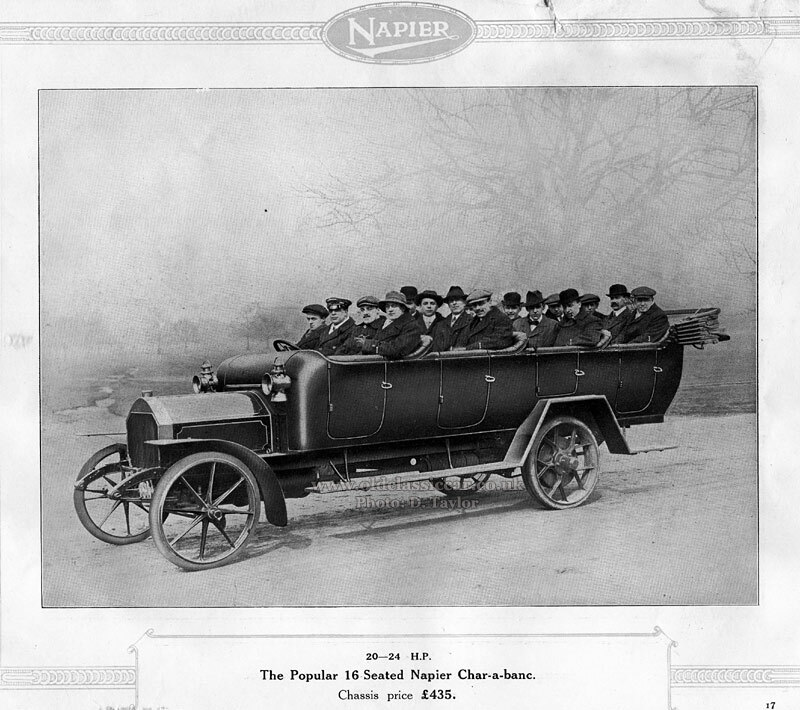 A 16-seater char-a-banc based on a 20/24HP Napier chassis. While there is at least a folding roof, there doesn't appear to be any windscreen. Hold onto your hats, ladies and gentlemen. Somehow, I doubt that many daytrippers today - some 100+ years later than this catalogue was printed - would put up with such potential discomfort. People were a lot hardier in those days, clearly, or perhaps just desperate to have a pleasant day out, away from the inner-city life they had to endure for the remainder of their week. At last, a vehicle with more than a semblance of weather protection. Not for the "Business-getting Traveller's Brougham" owner a life of exposure to rain, snow, mud, or intimate liasons with low-flying pigeons and their ilk. No, this enclosed machine came equipped with not just a windscreen, but also a fixed roof and floor-to-ceiling - fully glazed - doors. Luxury indeed. Pneumatic rather than solid tyres have also made an appearance. To the emergency services, and four different styles of ambulance. Two have spoked wheels, while the other pair have solid artillery types. That at the top left is in the livery of Willesden Board of Guardians, while below it is a simpler creation, destined for St. Helen's Corporation. 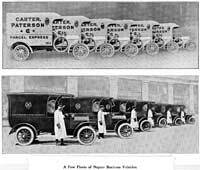 At the top right is an impression of a different vehicle, that was operated by the Ambulance Corps. It bears the name "Harvey Reeves". 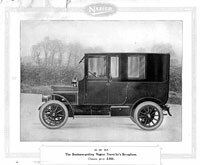 Reeves was a Councillor and also Mayor of Northampton at the time, and led a campaign to raise funds for the purchase of a motor ambulance. 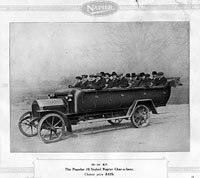 The Napier was their choice. The history of this very vehicle, and a couple of period photos of it, may be found on the Rushden Heritage website. The fourth ambulance shown here looks like a re-working of the first image, but this time sporting the name "Brentford Board of Guardians". All are fitted with pneumatic tyres, understandable given their cargo. 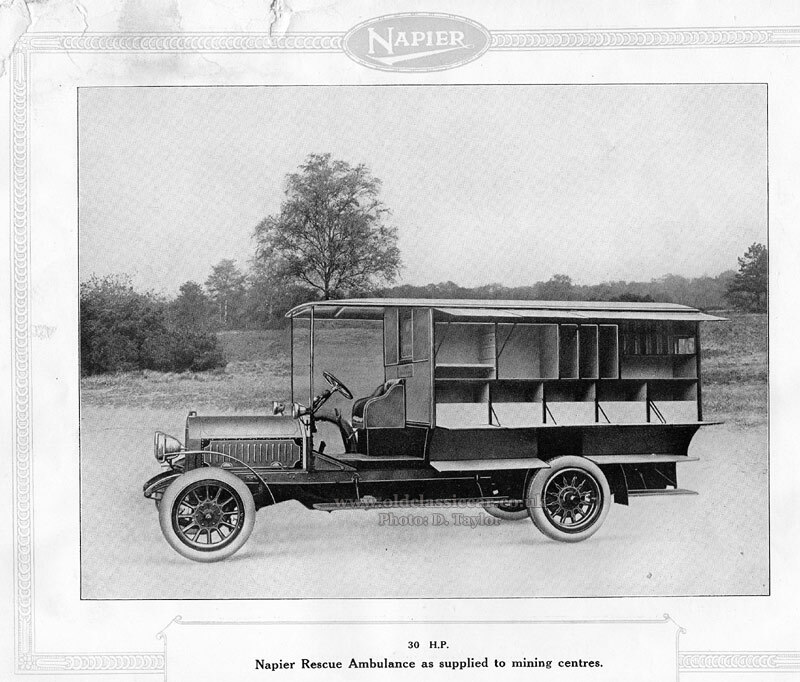 This is the Napier Rescue Ambulance, designed with treating injured miners in mind. 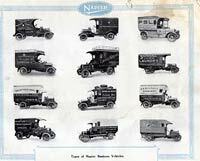 Twelve different types of van appear on the page following those for ambulances, all signwritten to best effect. Businesses operating them were: Morriston Laundry, The Floral Depot Ltd, E. Wheatland & Sons House Furnishers, The Gas Light & Coke Company, The Orchestrelle Company, Carr's Biscuits (Manchester depot), Durbin & Allwright, Glen Rosa Laundry Co. Ltd., PSL Laundry (Wolverhampton), Snowball Country Laundry ("Isn't It Nicer to Have Linen Washed in the Country? 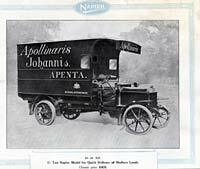 "), Army & Navy Auxiliary Co-Operative Supply Ltd, and once again, Mr Jones' fish van from Swansea. Several more types, one or two that have already made an appearance, are on this page. 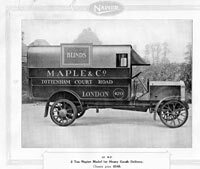 A second example of Catesby's Li-Nola van is shown, alongside another for Kennard Brothers (Drapers), and another for blind maker Maple & Co. 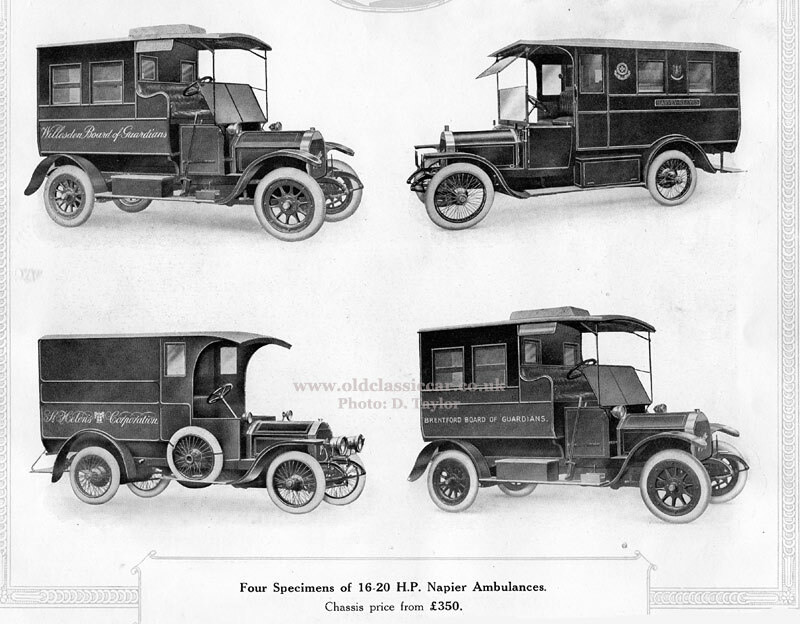 Taking centre stage is a line-up of char-a-bancs, while below them are three more vans belonging to different companies. 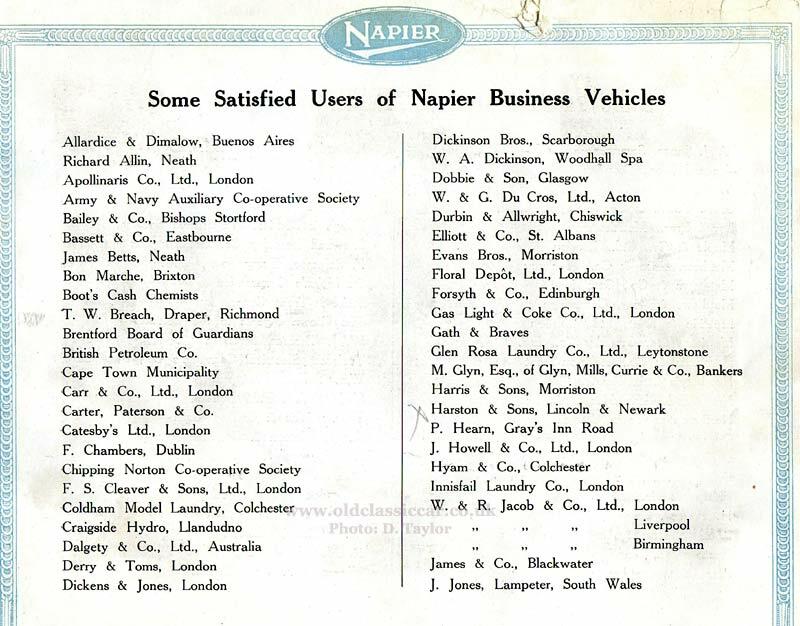 The final page lists many of Napier's happy customers. Many are in the UK, but three hail from distant parts. These far-flung customers are Allardice & Dimalow (Buenos Aires), Cape Town Municipality, and Dalgety & Co. Ltd. (Australia). 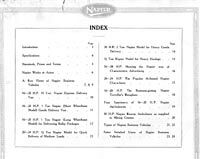 The former owner of this catalogue, namely Harston & Sons of Lincoln and Newark, is also listed, and is highlighted by a pencilled cross. It's quite unusual for catalogues dating back over 100 years to turn up, especially in this condition. Thanks once again to David, for taking the time to carefully scan each page of his catalogue, zip them up, and email them over. If anyone reading this has similar publications that they'd be willing to share in this way, please do get in touch. 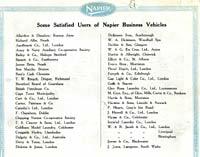 More Napiers on Old Classic Car. 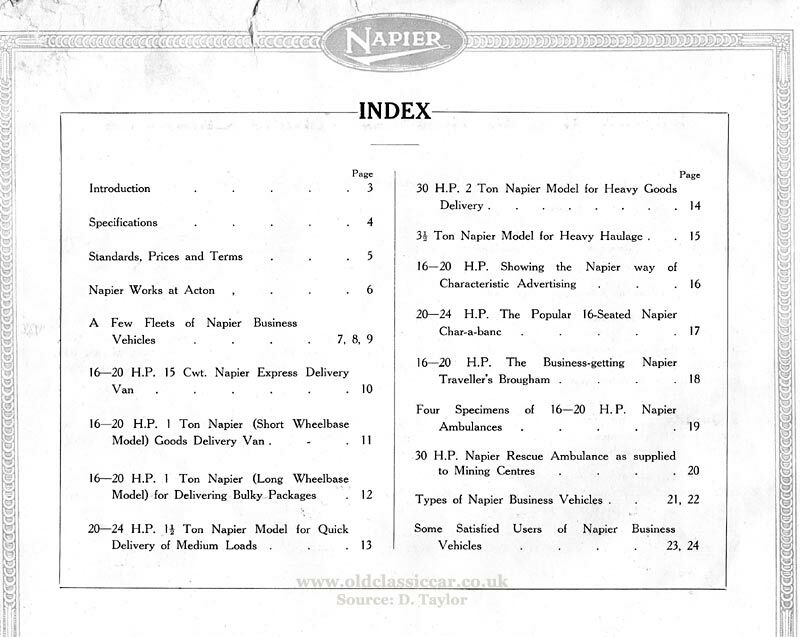 Below are a few links to related Napier items on this site. 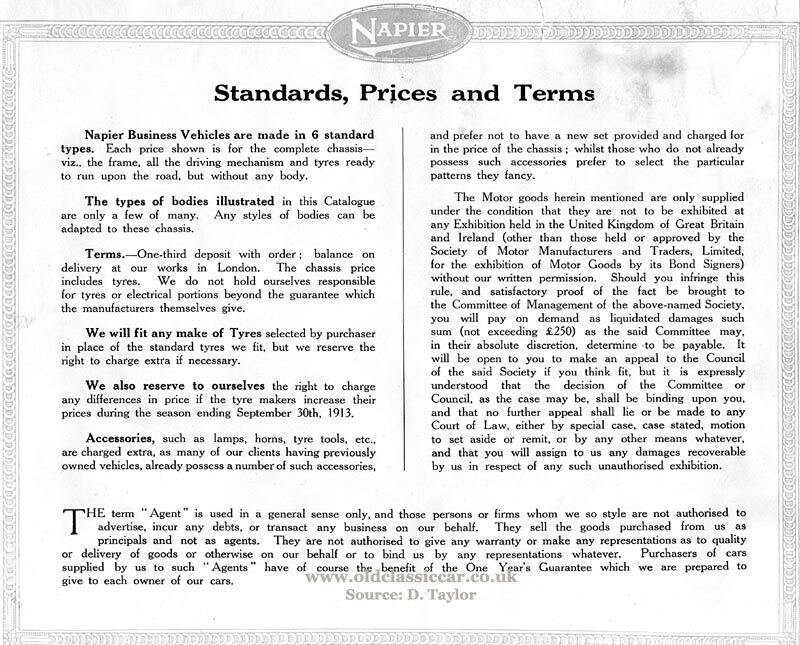 A review of book titled "Around The World in a Napier"